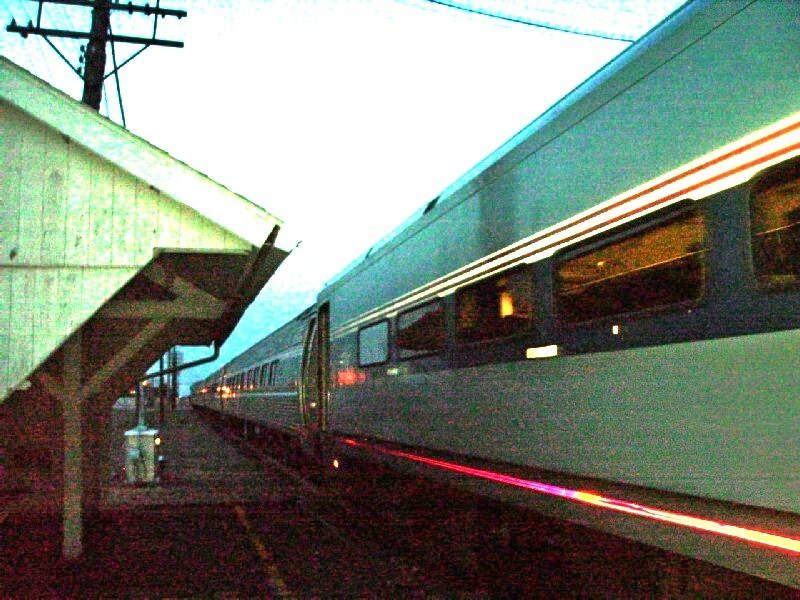 The Illinois Zephyr leaves Quincy at 6:12 AM, connecting in Chicago with the Capitol Limited, which is scheduled to arrive in Pittsburgh at 5:04 AM. Since I didn't want to get up that early two days in a row, I opted to leave a day early on the evening Carl Sandburg and layover in Kewanee, and then take the Illinois Zephyr the next morning. This allowed us to arrive (7:27 pm) and depart (8:09 am) at reasonable hours; and the Kewanee Motor Lodge, a nice mom and pop motel, was only a few blocks from the Kewanee station. 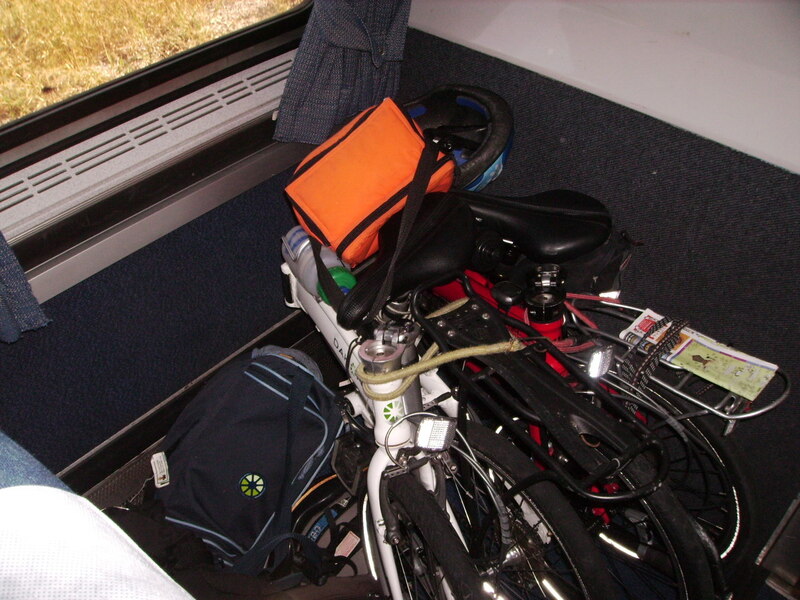 Folding bike cubby hole on the Carl Sandburg. The two full size bike cost $10 a piece to transport. Folders go free. I tried to capture the Carl Sandburg departing at twilight from the Kewanee Amshack. The interesting thing about the train was that it was made up of what are called Amfleet II's, cars normally used on long distance, overnight trains. The seat pitch is larger than the Horizon cars normally used, and allow one with even long legs stretch out on foot rests. Waiting for the Illinois Zephyr. I could have called this the "capital" tour. 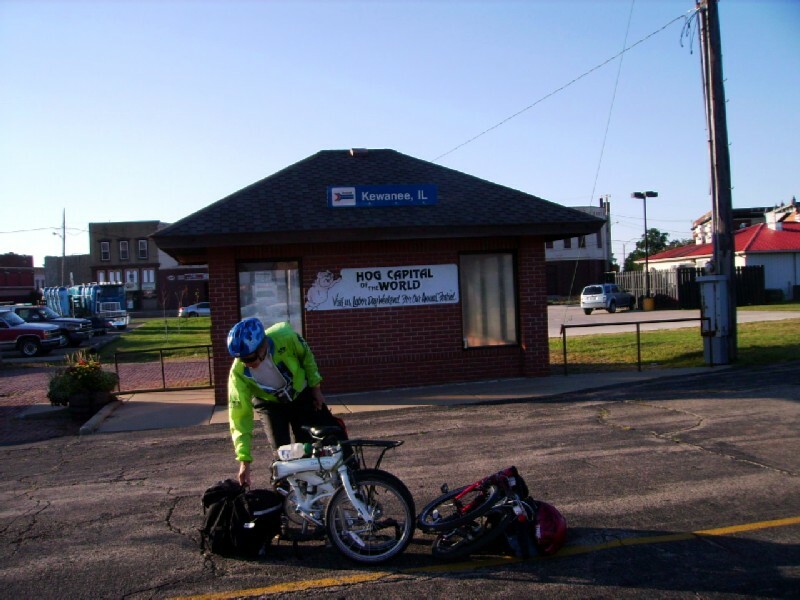 Not only did we overnight in the Hog Capital of the World, we also had a lunch stop at the Tube Capital (Mckeesport, PA), spent a night in the Coke Capital (Connellsville, PA), and rode the Capitol Limited to and from Chicago. 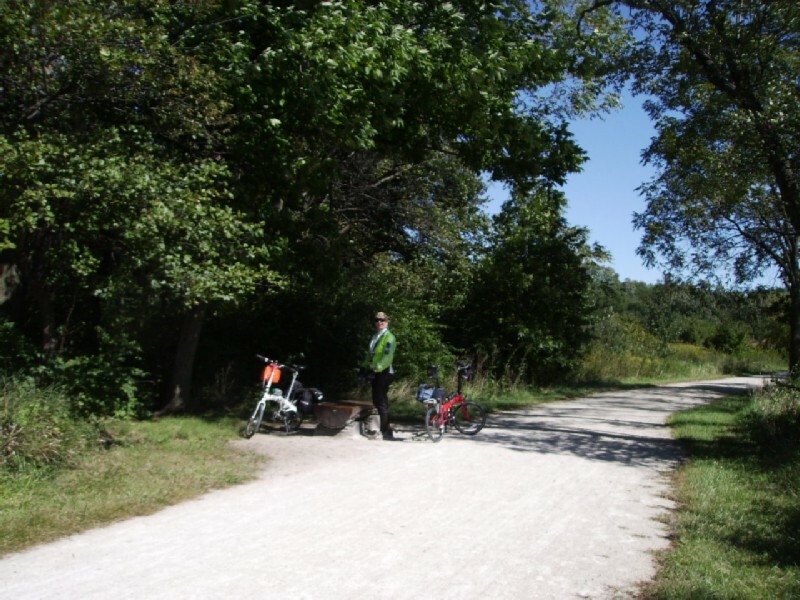 Our very first rest stop along the path in Herrick Lake Nature Preserve, Warrensvillle, IL. Part of the preserve was prairie and part dense woods, and passed along its namesake, Lake Herrick. 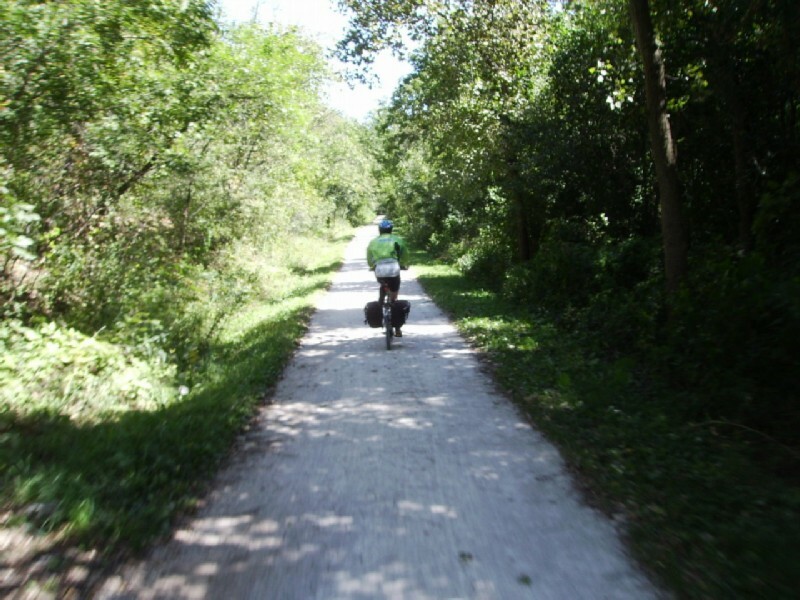 Along the Illinois Prairie Path Aurora Branch between Warrensville and Wheaton. After enjoying a nice lunch at the Egg-clectic cafe (I keep wanting to call it the Egg-centric cafe) in downtown Wheaton, we followed the IPP main stem through suburban village after village until the end in Maywood. From there it was short ride on a side street and then a path through a cemetery to the end of the CTA Blue Line at Forest Park. This line heads east to the Chicago Loop about 2 blocks from Union Station and then loops around and runs northwest to O'hare Airport. We had a choice of the CTA or Metra UP West rail line; and opted for the CTA because it runs every 10 minutes vs. every hour for the Metra. 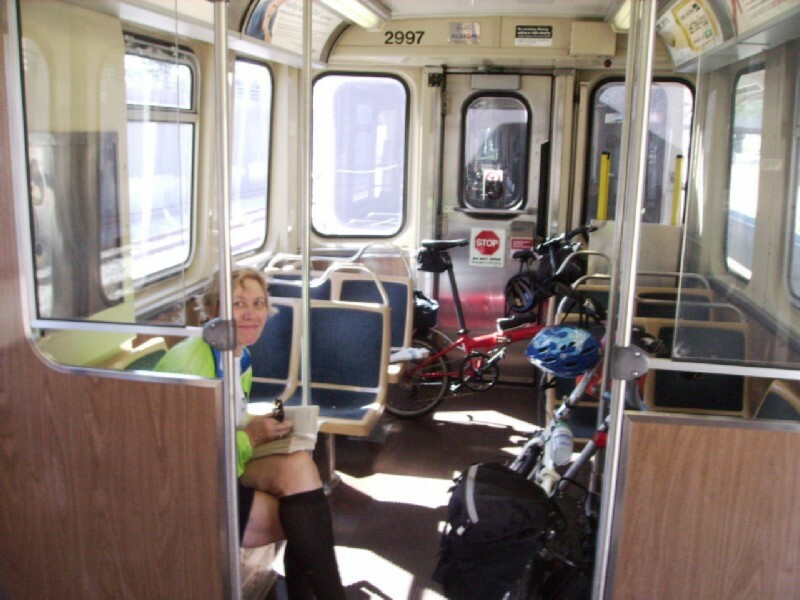 The CTA embargoes bikes during the rush hour beginning at 4:00 PM. This was not a problem since we got to Forest Park about 2:00; and as you can see our car was almost empty. 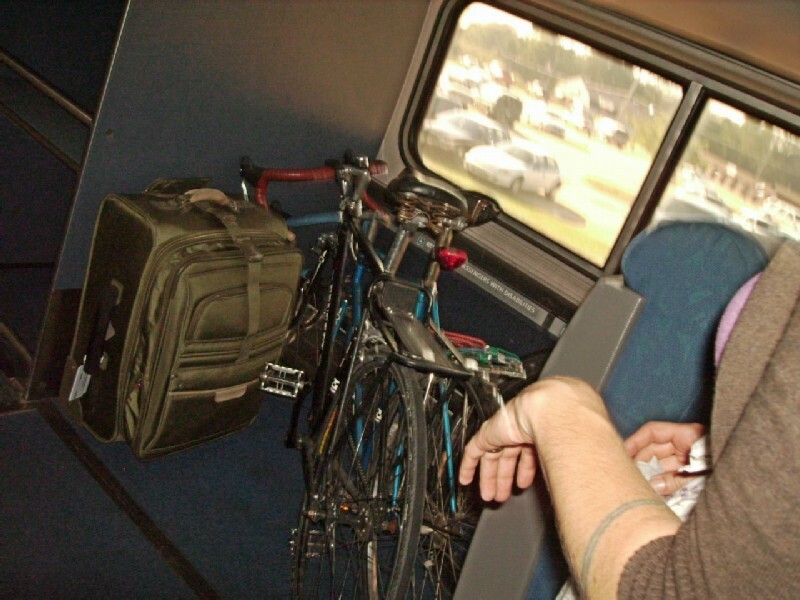 On the other hand the Metra only disallows bikes in-bound during the AM rush and outbound during the PM rush. Of course, folding bikes are the exception; but there may be a rule that they be bagged. In any event, I wasn't interested in folding them. The disadvantage of the Blue Line was that I could not figure out how to get our bikes safely up the escalator at the Clinton Station; and there was no elevator. So we had to carry the bikes with luggage up three flights of stairs to street level. Fortunately, a lady helped Jeanine up the stairs with her bike.